In her memoir ‘Turning’, Jessica Lee swims in the lakes surrounding Berlin all year through, alone and in company, and sometimes to the bemusement of locals. ‘Waren Sie baden?’ (were you swimming?) she is asked incredulously by well wrapped-up walkers. The answer is always yes, even when she has to hammer cracks into the ice to create a swimming hole. Lee is a connoisseur of water. The water in Kiesee is ‘glorious – crisp and glinting, like light filtered through an aquamarine gemstone. I’ve been waiting for this lake all summer. Sandy without being murky, cold and clear but emerald at its deepest.’ At Stechlinsee, next to an abandoned nuclear power plant, the water is blue green with algae: ‘it’s luminous, thin, the clearest water I’ve ever seen… The clarity of the water and the brightness of this small bloom of green are a joy to behold. It is not the choking stuff of a stagnant lake, but alive and clear. In the water, it seems to glow.’ Later, at Bögensee the water is ‘brown, toffee-like and thick’ – and full of eels. Things only turn worse in the winter. The cold – for Lee, as for other open water swimmers who have written about the experience – is part of the appeal, or at least the endorphin rush that follows a cold dip. My enjoyment of this book was in part a vicarious endorphin rush, experienced by reading about someone else doing the hard work of swimming while I remained warm and fully clothed. I was slightly concerned by Lee’s assertion ‘there’s a popular misunderstanding about hypothermia’ particularly after she’s fallen into a wintry lake, fully clothed, while trying to hammer cracks into its icy surface at Bötzsee. There’s a fine line between sensation seeking and masochism in this book. Yet Lee’s narrative is full of ways she is trying to find balance and come to terms with pain – with anxieties resurfacing from childhood, and the pain of a breakup with a boyfriend, with whom she’d swam with the previous year. Jacob is a recurring figure as Lee remembers places they’ve swam together, and, often revisits them, alone to reclaim them for herself. One of the appealing currents in this narrative is a tender love story about the end of a relationship, told sweetly. Reading this book is like encountering the calm yet moving waters of a lake – many layered, with more going on than meets the eye, ultimately clear and refreshing. Ebba Brooks is a former journalist and book festival founder. These days she teaches creative writing at the University of Leeds and digital skills at the University of Salford. You can read more about her on her blog. 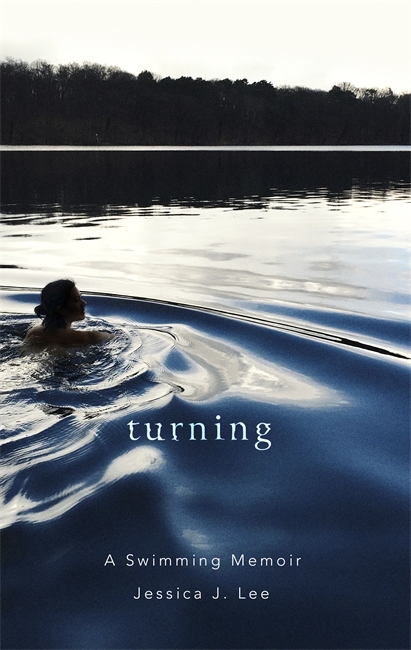 Posted in Reviews and tagged berlin, Book Review, creative non-fiction, Jessica Lee, Memoir, open water swimming, swimming, turning. Bookmark the permalink.